There were only 2 reviewers at St Kilda this month - but they reviewed 4 books between them! The series is about a boy called Sam who finds out how to travel through time. Thoth statues and 7 coins allow you to travel through time. In the 1st book – The book of time - he travels to Iona where monks live in the time of the Vikings. He also travels to ancient Egypt and to the Battle of Flers in World War 1. In the 2nd book - The gate of days - he goes to Ancient Greece, Pompeii, and prehistoric times. Along the way he finds out his dad is trapped in the dungeon of Vlad Tepes (the model for Dracula). Sam also finds a girl called Alicia who he had lived with until a couple of years ago. In the 3rd book - A circle of gold - there is an amazing twist which I am not allowed to tell as it would spoil the story! Katie has missed the school bus because she slept in. When this happens she always takes the shortcut through the park and through the trees. She has an accident and grazes her elbow. Something lands on her head – she looks up. She freaks out and looks at her elbow and the graze is completely gone. 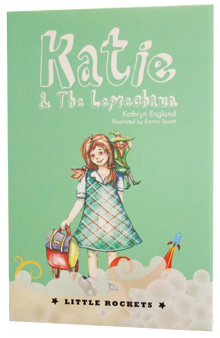 There is a leprechaun who is invisible to most people, but not to Katie because she has green eyes. A lady walks past while Katie is talking to the leprechaun but it looks like she is talking to herself.